For anyone planning to build content sheets, one-shots, settings, classes, loot tables and the like, please include this badge on any material you put on the 'net! Respect Hank’s copyright and do not incorporate any of his content into a derivative work without his permission. This statement goes double for art. 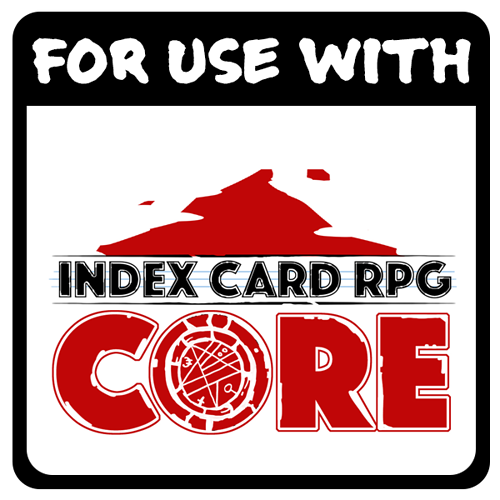 Under the terms of the international Creative Commons License, you can create content for use with ICRPG, but you can’t incorporate CORE rules, monsters, spells, or loot verbatim. Use a citation to the source, if you need to reference the source. When writing adventures, you can use terms like Timer, Threat, Treat, Disruption, Location, Obstacle, Goal, etc. You just can’t use the definitions of these concepts or explain them. The rationale here is this: we want people to actually buy Hank’s work. So, help him out by not giving away the mechanics. Respect Hank’s brand and the “look” of ICRPG. If you make something that looks too close to the original, people may confuse whether your work is part of the brand. You have to have Hank’s permission to create something with that ICRPG look. If You're a New User, Read This First! Doesn’t get any clearer. Thanks for the guidance. Should we change include this new cite now since its ICRPG social HQ now? If so so we replace facebooks link or keep both? Hey @DropDice, yes, I would definitely include the new site along with the existing links: ICRPG.com; Runehammer on facebook; and Runehammer on YouTube. The new site here just replaces the Google+ community, but having all four definitely showcases all of the ways to access all things Runehammer. Well #5 went the opposite way than I expected. I’d been thinking the challenge was trying to match his style to give the entire line of affiliated products a unifying look–and that intimidated me super bad. But just having the art be “not like that” freaks me out a lot less. I feel like I can do “not like that”.